Would you like to learn to write lyrics that incorporate the same magic and flair of your all time favorite songwriters? If so, here's an article I wrote on the topic that got an amazing reaction from the 1000's of songwriters subscribed to my newsletter. How can I write powerful, emotion packed lyrics? This is a great question, and right now I’d like to give you two tips that will make it impossible for you to NOT write great lyrics. For a long time I’ve been putting a lot of time in improving my writing skills. And I don’t just mean lyrics. Books… articles… you name it. I really enjoy writing… it’s never been something I want to do full time or anything. It’s sort of like playing music for me. It’s therapeutic and is a way for me to express myself. Anyway, when I do anything at all I want to do it well. So because of this interest in writing I went out and bought many books on how to write well. As I combed these books for useful advice, I stumbled across something very interesting. There was a strange practice that many of the “great” writers used to undertake. And it’s something I would have never thought of unless someone told me. I practiced this new exercise, and magically my writing instantly improved. After a few weeks of this, people reading my works did not even recognize it as my writing. What if I could use this new exercise to improve my lyrics? … it worked amazingly well! I bet you’re wondering what this exercise is, right? It’s actually so blindingly obvious that you’ll wonder why you didn’t think of it yourself! Take a page of lyrics that you love. Write out the lyrics in your own handwriting. This is the one exercise that is practiced by thousands of writers all around the world. And if you practice this exercise, your lyrics will instantly improve. I mean, how could such a simple exercise allow you to make such large improvements? Well, let me explain why your transformation to “Lyric Master” is going to happen as you do this. … As you write, you will notice yourself going through a similar thought process as the person who wrote the lyrics. You will be taken on the same journey as the writer went on as he wrote the piece. And as this happens, you will learn to write lyrics in this same inspiring way. It’s simply amazing, and you HAVE to try it! There’s something else going on as well. And this “other” thing is the reason you MUST write out the lyrics by hand, and not on a computer or some other way…. Ok, that last paragraph may have sounded like a mouthful!Let me make this clear by telling you the effect of doing this exercise. When you do the exercise for long enough, you unconsciously absorb information and gain a deep understanding of how the lyrics were created. When it comes to writing your own lyrics, this new understanding begins to “seep out” in your writing, and you notice that your lyrics contain some of the qualities of the lyrics that you copied out. That's why this technique is so effective. It allows you to learn to write lyrics in a way that incorporates all the magic of the artist whose lyrics you're writing out. What Should You Do Right Now To Learn To Write Lyrics? Ok, let me give you a rock solid plan for you to follow.Please at least give this a go, even if you are skeptical that it may not work. I promise you will be delighted if you just give this a shot.On a side note: as I went through years of research learning about how to write great music, something hit me hard.Sometimes the things that work the best are the things that you think would never work. And sometimes when you think something’s “bound to work” it fails miserably! Think of three songs whose lyrics you absolutely LOVE. Print out copies of these lyrics. Over the next three days, write out these lyrics, one song per day. After these three days, make an attempt to write some original lyrics. Do your best to simply let them flow out, and don’t think to much about what you think should be happening. You’ll be pleasantly surprised when you realize you’ve inherited some of the qualities of your favorite lyricists! After you’ve gone through this process and proven that it works, you will no doubt go out and begin writing out many more lyrics, transforming your own lyrics in the process. Be sure to use this technique. 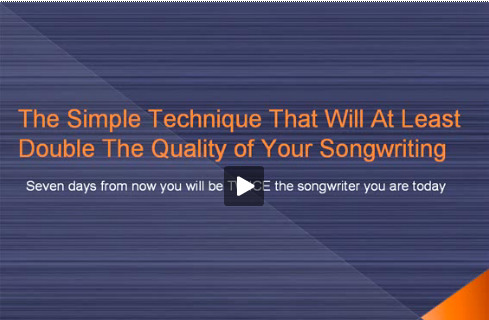 It’s one of the easiest ways to make instant improvements in your lyrics. Articles Related To "Learn To Write Lyrics"